FlyToMap™ is a valid and interesting alternative, Benetti Yachts Top Ten since 2008 Featured in : On the Deck ► The charts downloaded are resident in the app. It works WITHOUT mobile coverage! 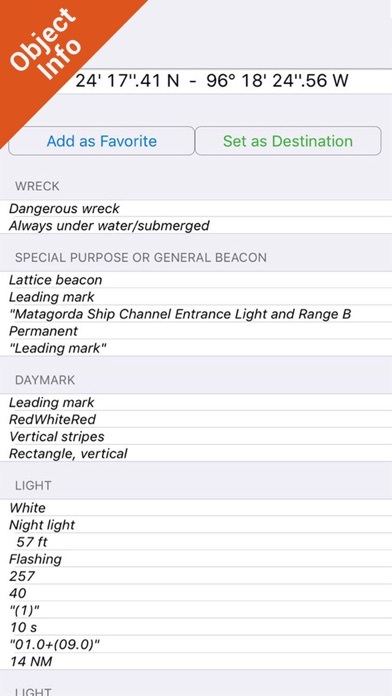 Flytomap All In One HD works on all Apple devices FlyToMap™ offers a revolutionary app; you can download any chart worldwide (500+) free of charge - All USA Marine charts (US All, East, West, Great Lakes, Major Rivers,Florida, Texas, California, etc.) - more than 150 US Parks and Forests - New Zealand Nautical charts - All Europe marine charts - 200+ major EU parks - most famous world holiday ie: Caribbean, Seychelles, Mauritius, Maldives, Canary Islands, Azores, Bora Bora, Bali, Oslo Fjord .. and many more. - USA Lake Maps 15000+ : Minnesota, Maine, Michigan, Massachusetts, Wisconsin, Texas,California, Florida,Iowa,North and South Dakota...and many more. -Canada Lake Maps: Alberta, Lake of the Wood.. and many more. ► Worldwide Marine and Outdoor Maps available, thanks to viewer.flytomap.com ► Worldwide Satellite images overlay on charts ► Worldwide Terrain features overlay on charts, thanks to Open Street Map, Open Cycle Map, Bing,Earth,GMap ►Interactive Weather forecast ►NOAA raster charts seamless with continuous updates from the official Government server Now with ActiveCaptain - Worldwide boaters community, with * 200.000 + Captains Use to Explore: √ Latitudes and Longitudes to go to your favorite places √ Search your Favorite points directly √ Zoom, Rotate and Pan fast just by a finger touch √ Quick Object information just tapping, thanks to vector technology √ GPS Heading Vector Towards the direction movement √ Distance Measurement Tool to easily calculate the distance from one location to another √ Route planning, Waypoints - Insert the target/destination and see in real time your speed, distance and bearing √ Magnified Lens for all info √ Unlimited Tracks, Markers, Geo-tagged photos, records and share via email, visible on Google, Flytomap Viewer, KMZ format - Store your track without the need of cellular data or mobile signal √ Select Depth Contours √ a la carte menu √ iOS background mode - Flytomap works in background as well, you can swap with another app and receive/make calls send sms while track recording. √ Optimized battery usage √ And so much more to come - It’s the only app you will ever need! Our charts are installed on: GARMIN NAVICO LOWRANCE B&G NORTHSTAR EAGLE SIMRAD Follow us: ▶ Twitter @flytomap ▶ Web Site flytomap.com ▶ Facebook facebook.com/flytomap FlytoMap™ has a wide range of Applications and Maps for you to use - Free of charge on Flytomap All In One ! 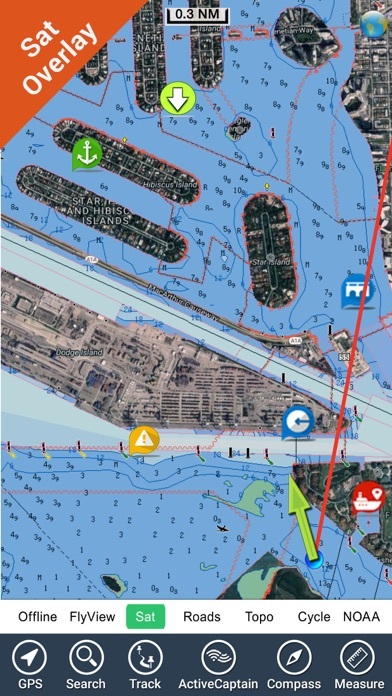 - WATER MAPS Electronic Nautical Charts (ENC) from NOAA and Corps of Engineers compressed to store the largest coverage. 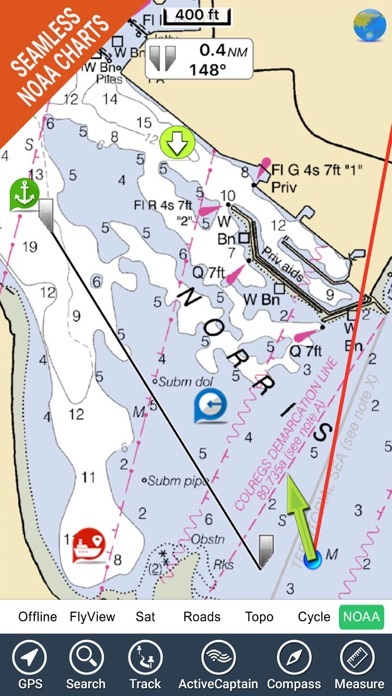 You can transform your device in a chart plotter with best NOAA-USACE, ENC S57 cartography; which includes Coastline, Anchoring areas, Fishing areas, Restriction areas, Obstructions, Rocks, Buoys, Beacons, Lights, Depth contours, Spot Soundings and more. - LAKE MAPS High quality lake maps with detailed information and important features compressed to assure the larger coverage. Lake maps contain the most important lakes with detailed Depth Contours, Boat Ramps, Fishing spots etc. Maps also include Trails, Roads and Railways information. - PARK MAPS: Extremely advanced embedded electronic charts with all information collected from the National/State Park and Forest Services and many other local sources. The maps contain all trails (Hiking, Biking, Equestrian trails etc.,) and Points of interests (POI) like Campgrounds, Visitor Centers, Lookout points, Eating places, Ranger Stations, Picnic areas, Boat/Canoe ramps, Parking areas etc.. - TRAVEL MAPS These Maps cover most interesting touristic areas combining Sea and Land information to allow you a complete travel experience. Continued use of GPS running in background can decrease battery life. I downloaded this app for ICW on Florida South West,it was great keeping us in the Ditch out of Tampa, With AT&T phone it was very accurate and kept us on course and out of trouble, search engine is also nice, it will be helpful to add bridge name/number. Worldwide marine maps online is a nice features! But it tracks you even when not using so I have tracking set to Never. If it would change that to tracking While Using I would up the rating. It is a battery hog even when not using and may be a privacy concern. I always turn off tracking on apps that are None/Always on tracking and try to remember to turn tracking back on when I need it. I bought it when I had an older phone and didn't use the app much because it was wonky, but now with a 6s I expect better performance. I thought you could key in places to go and it would be gps but it isn't. Very disappointed I paid the money. I use this app first as a back-up to my main GPS on my 24 Thompson on the Great Lakes. I use it while fishing in my 14 Starcraft as the main GPS map. I've found it very useful and each update just adds to my satisfaction with the app. I have saved routes and waypoints and in my smaller boat it sure beats best guessing to pinpoint previous good fishing spots. This is the first "sucker app" I have purchased in the year I have had my Apple iPad 2 and iPhone. It is simply terrible...the teaser website implies there will be links to charts with information on bodies of water. Sorry, folks...only one percent even exist. The data for the downloaded map content simply won't display. I am an IT professional and have not seen a product this shoddy since the Commodore 64. I really thought Apple had higher standards. 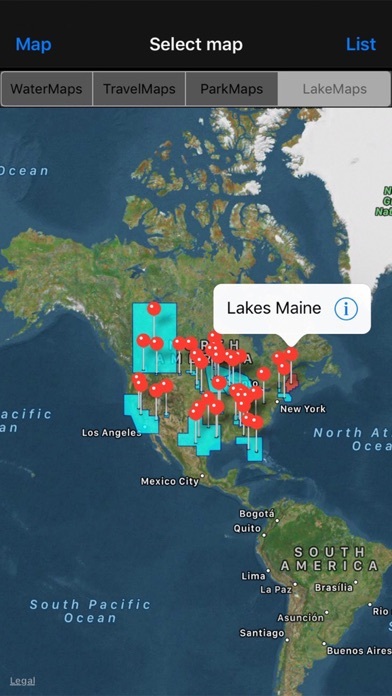 This app is not what they say it is it dose not have the lake maps like they say. There are only two lake maps that you can find. And it said you can down load all the maps available. It charged me for the texas lake maps and it didn't have the lake maps either. This is nothing but a rip off and if it is lake maps you want go buy a gps with lake maps on it. I bought this app even though it's expensive because it said lake and rivers. It even has a map for Georgia, but it has no maps or rivers for Georgia in it. Useless to me until they update it. Have had three updates so far and nothing yet. Just sent a second email to them, maybe I'll finally get a reply. 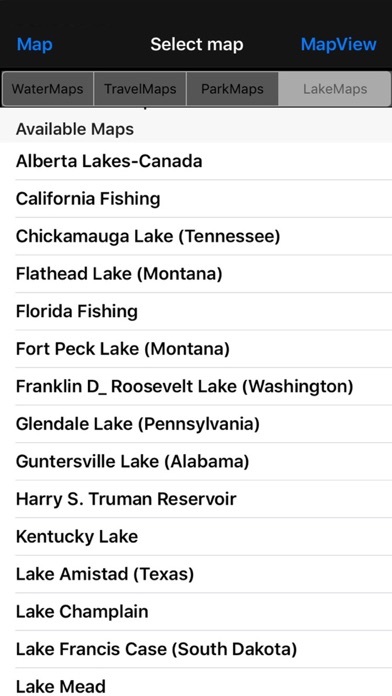 I bought this app to see the depths of the lakes I fish and there are only about 15 lakes in the whole country and not one of them is even in my state. Take your ten bucks to a store and buy the maps you need.